Ah, newsjacking – the art of piggybacking off of the day’s biggest news stories and using it to turn attention toward yourself. This brilliant communications tactic is one public relations professionals should certainly take advantage of because, quite frankly, it works. Marketer and author, Seth Godin, coined a term that I believe we should all be familiar with: Ideavirus. According to Godin, “an ideavirus is an idea that spreads through various networks like the Internet and grows rapidly within a target population.” The unique thing about an ideavirus is that it’s infectious. When an idea becomes infectious, it spreads and becomes bait for newsjacking. Take, for example, the ALS Ice Bucket Challenge–an ideavirus through and through. It began with the efforts of a few Bostonians looking to make a change and soon erupted into one of the most viral trends to ever grace the Internet. The Challenge’s success was utterly remarkable, with countless individuals and brands taking part. In fact, because of this ideavirus, the ALS Association received an estimated total of $115 million in donations. Trends that become viral are important to watch and can open the door for opportunity. How exactly can professionals take advantage of such opportunities, you ask? Newsjacking, my friends. I’ve done my research and to further illustrate the effectiveness of this tool, I now present to you my favorite examples of newsjacking: the good, the bad, and the ugly. The Good: The Salvation Army gets creative. The Salvation Army recently utilized the “brilliance that is newsjacking” by taking advantage of our super strange and utterly inexplicable obsession with “#thedress.” You know the one – the white and gold/black and blue one. Salvation Army made the brilliant decision to use this ridiculous obsession to bring awareness to something that actually matters – and it worked. 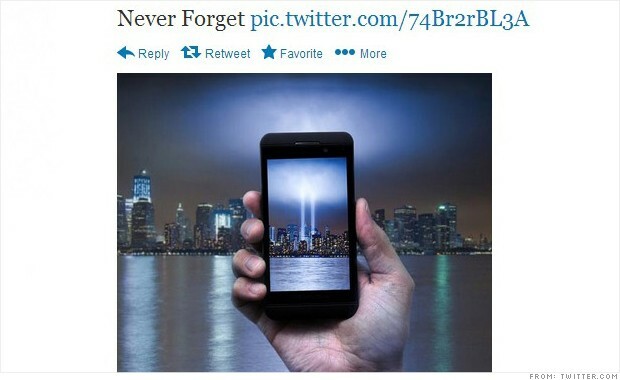 The Bad: AT&T gets tactless. The anniversary of 9/11, what was quite possibly one of the darkest days in American history, is certainly something to be remembered. But did AT&T get it right? Nope. Taking advantage of a very sensitive subject in order to drive sales probably isn’t the greatest idea. Unsurprisingly, the post received a lot of backlash from people who felt that AT&T was guilty of tactless newsjacking. The post was taken down, apologies were made, and the situation soon blew over. The Ugly: DiGiorno, go stand in the corner and think about what you’ve done. “Terrible newsjacking” is brought to you by DiGiorno Pizza in what is quite possibly one of the most infamous examples of newsjacking gone wrong. When the hashtags “#WhyIStayed” and “#WhyILeft” were trending on Twitter, users shared their stories of abusive relationships. Enter DiGiorno. The person in charge of its Twitter account no doubt saw these trending hashtags and, in utter ignorance to the actual meaning of the hashtags, decided to jump on the bandwagon with the lovely tweet you see to the right. Rest assured, the tweet was deleted and apologies were made. 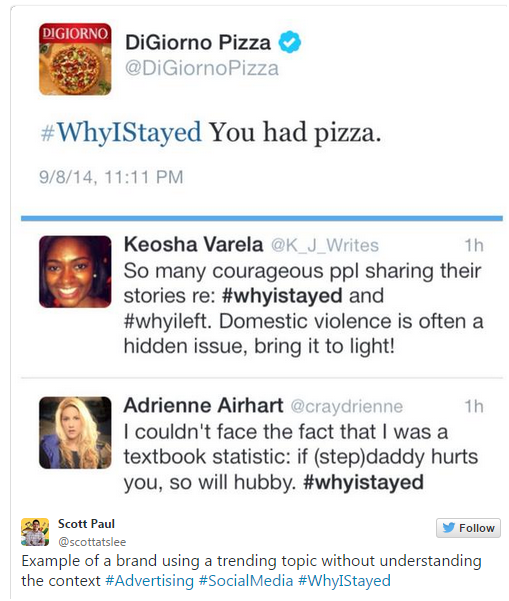 I’m not sure whether DiGiorno’s social media manager lost their job, but a lesson was certainly learned: do your research, people. These examples, along with the social media managers responsible for them, taught me three things about newsjacking. Stay on top of current trends, especially the viral ones. Stay classy. Newsjacking is great; tactlessness is not (*cough* AT&T). Understand the news. Don’t jump on a bandwagon you don’t belong on… DiGiorno. If you have any newsjacking rules of your own to add, let us know. Don’t forget to follow Innovative PR on Facebook, Twitter and Instagram.